Since the disappearance of Geraldine “Gerry” Largay, 66, of Tennessee, while hiking the Appalachian trail in Franklin County on July 24, little information has surfaced. Her relatives are now offering a $15,000 reward for information on her whereabouts. Relatives of a Tennessee woman missing since hiking in July on the Appalachian Trail in Franklin County announced a $15,000 reward Tuesday for information on her whereabouts. Her husband, George Largay, and his family are offering the reward to underscore support for the search efforts of Maine game wardens and state police and to try to generate new case information, according to a news release from the Maine Department of Inland Fisheries and Wildlife. Geraldine Largay, 66, was last heard from on July 22, when she sent a text message to her husband. The next day, she failed to show up for a scheduled meeting with him in Wyman Township. She was last seen wearing a reddish-colored pullover shirt, tan shorts, a blue hat, and a black and green backpack. She is an experienced hiker who was prepared with supplies. She had no previous incidents during her hike leading up to her disappearance. In a telephone interview Tuesday afternoon, George Largay said a memorial service for his wife is set for Oct. 12 at St. Bridget’s Catholic Church in Atlanta, Ga., where the couple lived for 11 years and have many friends. Largay said the timing of the reward comes as the most recent of the searches was completed on Friday, yielding no clues about what happened to his wife. He said he does not suspect foul play. He said he and his family need to know they are doing everything they can to support “the phenomenal efforts” by Maine authorities in the search for his wife. George Largay’s longtime friend, David Fox, of Nashville, Tenn., a public relations professional, said the family has been working closely with the Maine Warden Service and Lt. Kevin Adam in particular. He said there was a search of the trail area as recently as Friday and that winter is fast approaching in Maine. “Now, with winter coming on and the leaves getting ready to fall and the snow getting ready to fall, it seemed like there needed to be a big, strong push before the end of the summer, so that’s the reason for the timing,” Fox said. The Maine Warden Service was notified of Largay’s disappearance on July 24 and started searches and investigation that day. The search widened with tracking dogs, ground search teams, a helicopter, fixed-wing aircraft, all-terrain vehicles and horses. More than 100 searchers were involved in the search on some of the search days. Since the search was scaled back after Aug. 4, local search groups, tracking dogs and game wardens have conducted six more ground searches, according to a news release from the Maine Warden Service. No clues such as clothing, hiker accessories or backpacking equipment that can be identified as belonging to Largay have been found. Largay started her hike on the Appalachian Trail on April 23 at Harpers Ferry, W.Va. Her destination was Baxter State Park. Her husband kept track of her along the way and made frequent pre-determined stops to resupply her. On Sunday morning, July 21, she left her husband at the trail crossing on Route 4 in Sandy River Plantation, near Rangeley. Later that day, she texted her husband she was atop Saddleback Mountain. Her plan was to stay at the Poplar Ridge lean-to in Redington Township that Sunday night. Investigators have confirmed from hiker interviews that Largay did stay there that night. The next morning, July 22, she texted her husband George and indicated she was again headed north on the trail. Her next stop would have been the Spaulding Mountain lean-to. 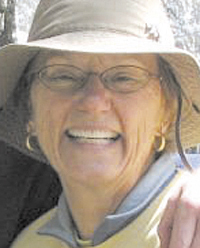 Her plan was to meet her husband July 23 in Wyman Township at the Route 27 intersection with the Appalachian Trail, but she never arrived. The Warden Service and the Largay family seek any information from hikers or others who have specific information related to Largay and her route on the trail, especially information related to July 21 through 23. The next phase of the search will be to wait for leaves to fall and have aircraft fly in areas where visibility is good and have not been searched, according to the warden service. The Maine Warden Service asked anyone with information to contact them at 624-7076 or www.maine.gov/ifw.